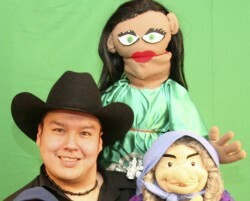 Winnipeg MB – CMA Entertainment is pleased to announce that DerRic Starlight and special guests Granny and Wind Dancer will Co-host the 2007 National Aboriginal Achievement Awards. Starlight and his two puppet friends will be in Edmonton – Starlight’s hometown – to provide red carpet coverage and backstage colour commentary at the gala on Friday, March 16. They’ll also share on-stage time with Adam Beach, host of this year’s special evening of recognition and celebration. Each with their own exceptional talent, Beach and Starlight embody what the National Aboriginal Achievement Awards are all about – achievement! DerRic’s story of success on stage and screen began one fateful Christmas morning on Tsuu T-ina Nation, when Santa brought Kermit The Frog into his life. DerRic learned the voice of Kermit, and the rest of Jim Henson’s Muppets followed. The residents of Sesame Street came next, and by his teen years, DerRic had amassed a catalogue of more than 200 voices. En route to realizing his dream of creating his own characters, DerRic studied arts, media, theater, filmmaking, puppet-making and comedy at several US schools, and attended master classes with some of the finest teachers. Today, each of his 40 puppets is handmade with love, and alive with unique voice, personality and style. DerRic tours extensively and travels the world with an engaging puppet cast, over 350 voices, and genuine knack for comedy. He has appeared on Beyond Words, Indigenous Circle, and The Sharing Circle, and had a dramatic role in the television movie Don’t Call Me Tonto. He is currently developing several of his own television projects. DerRic’s expertise in Muppet voices brought him to the attention of the Disney Group of companies, who enlisted him to do voice-overs for The Muppets of Oz Movie. The first puppet created by DerRic, Granny is the oldest and perhaps dearest. Inspired by his real-life grandmother, Granny is the loving ‘ring leader’ of the entire puppet roster, sometimes strict, and always spunky. She sports attitude, and being a respected Elder, tends to get away with lots. Granny lives time-honoured Aboriginal customs and dances Traditional Ladies’ Buckskin at Pow Wow. She’ll even be donning a new white buckskin outfit for this year’s National Aboriginal Achievement Awards. “If you have a dream and follow it, one day it will come true,” says Granny, who is living a dream of her own by Co-hosting the National Aboriginal Achievement Awards. A typical 16-year-old girl from Siksika Nation, Wind Dancer’s life is all about school, boys, being a diva, and Pow Wow. She dances Jingle Dress and is learning to sing, with hopes of following in the traditional footsteps of her loved and respected Granny.